A transit of Earth across the Sun as seen from Uranus takes place when the planet Earth passes directly between the Sun and Uranus, obscuring a small part of the Sun's disc for an observer on Uranus. During a transit, Earth can be seen from Uranus as a small black disc moving across the face of the Sun. 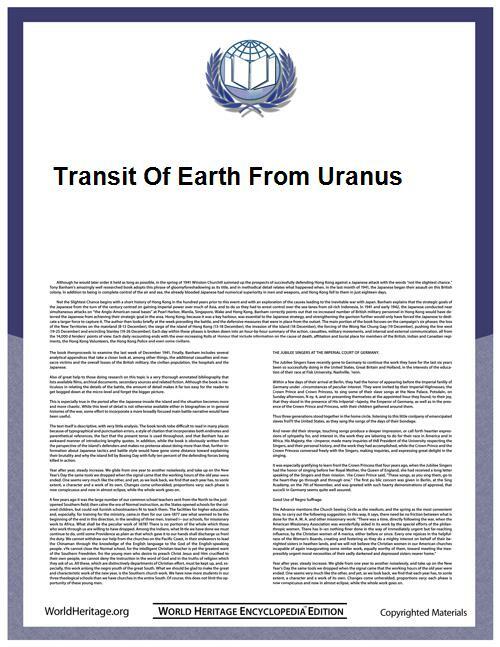 Naturally, no one has ever seen a transit of Earth from Uranus, nor is this likely to happen in the foreseeable future. Nevertheless, the next one will take place on November 17, 2024. 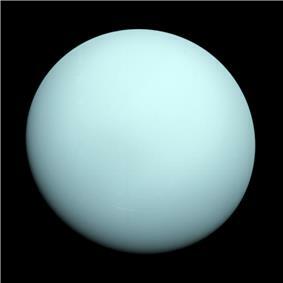 A transit could be observed from the surface of one of Uranus' moons rather than from Uranus itself. The times and circumstances of the transits would naturally be slightly different. The Earth-Uranus synodic period is 369.64 days. It can be calculated using the formula 1/(1/P-1/Q), where P is the sidereal orbital period of Earth (365.25636 days) and Q is the orbital period of Uranus (30,799.095 days). Transits of Earth from Uranus occur in clusters, with two such clusters every 40 years or so.